MicroStaffer's features integrated invoice generation that creates invoices directly from your scheduling data without any additional data entry. Flexible bill rate entry that apply rates based on user defined criteria. 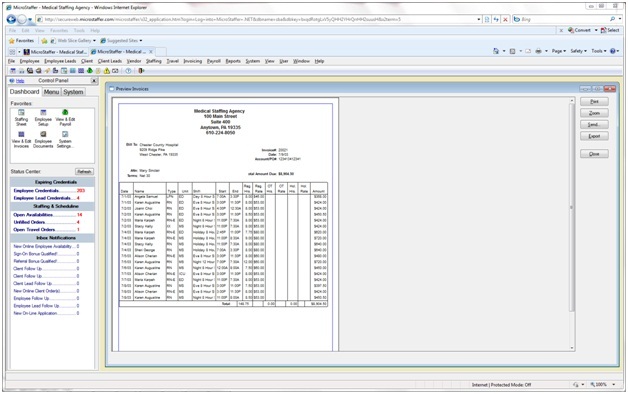 Batch invoice generation including invoice grouping. Daily and weekly OT and Holiday calculations. Choose from extensive invoice formats or we can custom design your format. Enter payments and edit Invoice data. Integration to Quickbooks and other back-office accounting systems. Post invoices on the web for client approval.